If you’re splitting up accounts or setting up a new machine, the process is similar. Apple makes it relatively painless to migrate data on one Mac to another. But you can also selectively migrate and split up multiple users on a single Mac into users across multiple Macs. You would do this if, for example, you have kids on a shared computer who now own their own, or if you’re leaving a job and want (and are allowed) to take your home directory with you. Migration Assistant is the app you use to perform a user migration. It’s found in the Applications folder’s Utilities folder. This flexible software can work in a variety of ways to transfer all or part of the applications, user files, and other settings on one Mac to another. You can start from Time Machine backup, another Mac, or a Mac drive configured as a macOS startup volume—including a disk image backup. Assuming the new Mac is set up from scratch with at least one user, here’s how to use Migration Assistant to move a user from one Mac to another. Launch Migration Assistant on both Macs and click Continue on both. On the Mac with the user you want to move (let’s call this account Alice), choose To a Mac and click Continue. On the Mac to which you want to move Alice, choose the From a Mac, Time Machine, or startup disk option and click Continue. On that same Mac, choose the Mac with Alice’s current account from the items that appear for selection. On the Mac to which Alice is migrating, now select what items you want to move in the Select the Information To Transfer list. In many cases, you will want to leave everything checked except all the users excluding Alice (see notes below). You want only Alice checked among the users listed. Click Continue and wait for the process to complete. After making sure the Alice account works correctly on the Mac you’ve copied it to, make a full backup. On the original Mac, log into to an administrative account, and open the Users & Groups preference pane. Click the lock icon in the lower-left corner and enter the account’s password. Select Alice in the account list and click the minus (-) sign at the bottom. In the prompt that appears, select the deletion option that makes the most sense (I explain more below). Click Delete User and confirm. When deleting an account, you can opt to retain the files that went with it. You can copy applications as part of this process, but if they are licensed to a different Apple ID than the one Alice uses, “Alice” may need to enter that other Apple ID’s password every time she updates apps. You should also check licensing to make sure you’re not accidentally pirating apps. For deleting users, you’re presenting with three choices (as shown in the screen capture above). The first, Save the Home Folder in a Disk Image, removes the account information from the system and the user’s home directory, storing its contents in a Deleted Users folder in the Users folder. 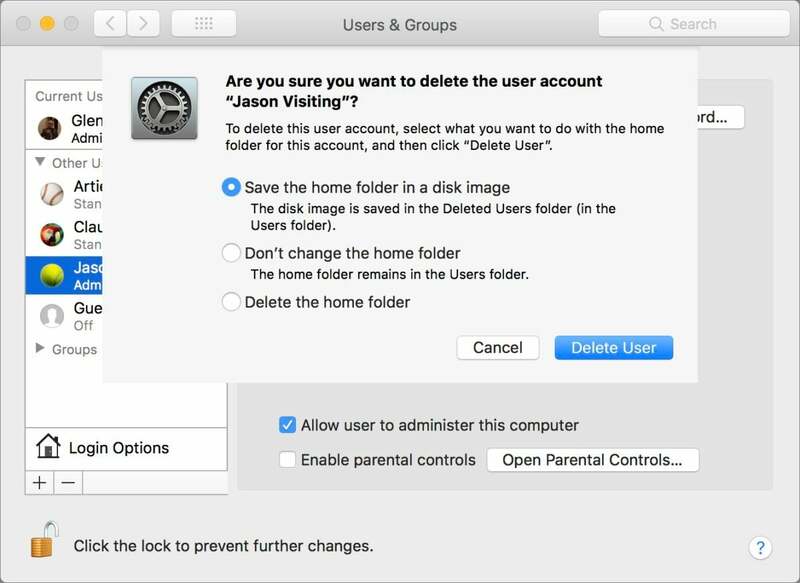 The second, Don’t Change the Home Folder, deletes system account information, but leaves user files along. The last, Delete the Home Folder, deletes system information and files. If the Macs are in different physical places, the easiest migration is via a Time Machine backup made to an external drive that you can carry from one place to another. The steps above are nearly identical, except you omit step 2, and choose Time Machine in Step 3. In step 4, select the drive and specific backup. No security code appears in Step 5 before you click Continue. This Mac 911 article is in response to a question submitted by Macworld reader Edward.